Born with the surname Näef in Alsace, France, Joseph Neef fought under Napoleon Bonaparte. He was fortunate to survive a head wound—but carried the metal ball until, at his request, it was removed upon his death. 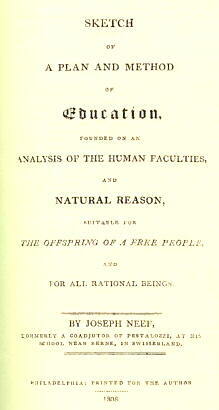 During the lengthy convalescence from the wound, Neef was drawn to the educational principles of Pestalozzi. Neef became a teacher at the Pestalozzian school at Burgdorf, Switzerland, and on Pestalozzi's recommendation, he established an orphan school in Paris in 1802. William Maclure visited this school and was impressed with Neef's implementation of Pestalozzian methods. Under contract to Maclure, Neef opened a school for boys at the village, Falls of Schuylkill, near Philadelphia, in 1809. Although initially successful, this and subsequent Neef-Pestalozzian schools closed within a few years, and Neef turned, in 1821, to farming near Floydsburg, Kentucky. Joseph Neef, Sketch of A Plan and Method of Education, Philadelphia, 1808. Reprinted by Thoemmes Press, Bristol, England, 1995. At Maclure's urging, Neef left his farm and, during the winter of 1826, joined Maclure in New Harmony. There, the educational system consisted of three levels: infant, higher, and adult. Neef, following Maclure's curriculum, superintended the higher school, in which were enrolled up to 200 students, ranging in age from five to twelve. 1. Cultivate in the child the power and habit of observation. 2. In ascertaining whether or not the pupil has correctly observed, let him or her use his or her own words, never permitting anything to be repeated from memory until after ascertaining that it is fully understood. 3. After ascertaining that the first step taken, or object examined is understood, proceed to a second. 4. Never take more than one step at a time, and each day before taking it, be certain that the previous step was thoroughly understood. 5. Instead of communicating a fact or thought, endeavor by questions to enable the pupil to work out the thought for himself. 6. When discussing any subject or object, if practicable, present the actual object, or next best a model; if that cannot be had, a good representation; lastly a correct verbal description. 7. Let the pupil, at an early age, become familiar with things, and the names used to designate things, before teaching the conventional signs for things. 8. Never call in even the best hearsay evidence when the pupil can be enabled to test the truth by personal observation. 9. Whenever a pupil is called upon to place a statement on the blackboard, let him in his own words described exactly what he is doing. 10. The pupils should be led to consider the teachers in the light of fathers or brothers, according to age; and freely to ask advice on all points. 11. As corporal punishment degrades, it should be avoided, and in some extreme cases of incorrigible pupils, expulsion should free the others from the contaminating influence. 12. In the study of the work of creation, the pupil should constantly have his attention and gratitude aroused for the great Creator especially as a means of checking vanity and presumption. These recollections of Richard Owen nearly sixty years after the failure of his father's social experiment at New Harmony stand in sharp contrast to the tone of Joseph Neef's lengthy letter to Robert Owen in response to Owen's Valedictory Address, in which Owen had criticized the educational efforts in New Harmony. The seven-page letter can be read in Hackensmith's biography. In his summary, Neef quotes from Owen: "My object in coming here was to benefit all, and if possible to injure none. "—to this Neef wrote, "If this has been your mark in coming here, then let me inform you that there never was a more unskillful archer than you." Neef's letter was dated May 13, 1827. He soon moved to Cincinnati, but by 1835 the Neefs had returned to New Harmony, where Neef managed the printing office. On March 23, 1837, two of Joseph and Luise Neef's daughters married two of Robert Owen's sons. In fact, it was a triple marriage, the partners being Richard Owen and Anne Eliza Neef, David Dale Owen and Caroline Neef, and William Owen and Mary Bolton. After his Luise's death in 1845, Joseph Neef lived with David Dale and Caroline Owen. An artist as well as a celebrated geologist, David's asked to paint Neef's portrait; according to family tradition, Neef objected, "but who wants to see an ugly old man?" Nevertheless, the portrait was allowed, and it is possibly the only surviving picture of Joseph Neef. Gerald Lee Gutek, Joseph Neef: the Americanization of Pestalozzianism, The University of Alabama Press, 1978. Is Richard Owen's Letter to Eli Tappan Lost? Hackensmith identifies the letter as follows: "Letter of Richard Owen addressed to Professor Eli F. Tappan, [President of] Kenyon College, July 19, 1884. The letter also contained a note to Benjamin Tappan [a distinguished Ohio judge who had strong ties to New Harmony and was father of Eli Tappan] stating 'a copy of Mr. Owen's letter revised by himself is herewith sent for your paper.' The letter was written with fine steep point pen in beautiful script interspersed with scratch-outs and corrections in his hand. Reproduced by permission of the Henry Smith Memorial Library, Indianapolis, Indiana." However, the library named searched for the letter in 1998 and could not find it. Another extensive search was then conducted in the Tappan family papers and other collections in Ohio. Experts were consulted, but the whereabouts of the Owen/Tappan letter remains a mystery.